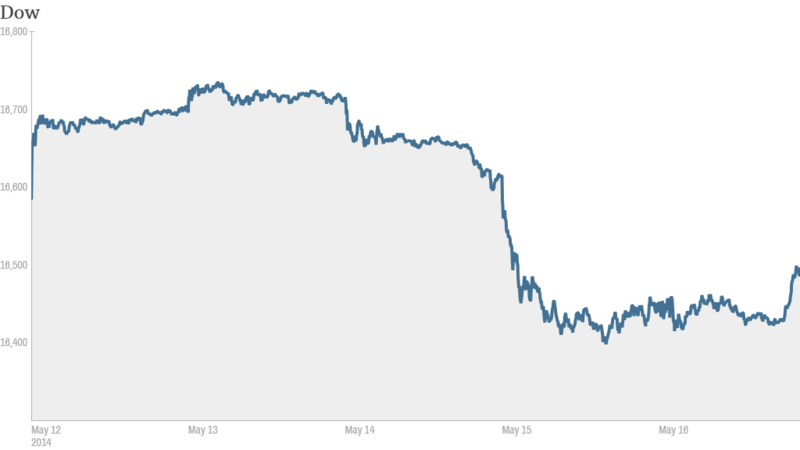 It was a volatile week for investors, but it ended on a high note. Stocks bounced back late in the day Friday, though the advance was not enough to push the Dow Jones industrial average into positive territory for the week. The S&P 500, which rose above 1,900 for the first time Tuesday, ended almost exactly where it started the week. The Nasdaq had the biggest gain Friday, helping the index notch a small win for the week. Meanwhile, the bond market has been on a tear. The yield on the 10-year note fell to a 6-month low below 2.5% Thursday as investors expect the Federal Reserve to keep interest rates low for a considerable time. Recent economic data has been mixed, and reports released Friday added to concerns about the lackluster recovery. An early reading on consumer sentiment in May unexpectedly fell, but a report on new home construction in April was strong. The European Central Bank is also expected to introduce new stimulus measures soon as the euro area economy remains weak and inflation is tame. While the overall market was treading water, a number of well-known stocks were making moves. 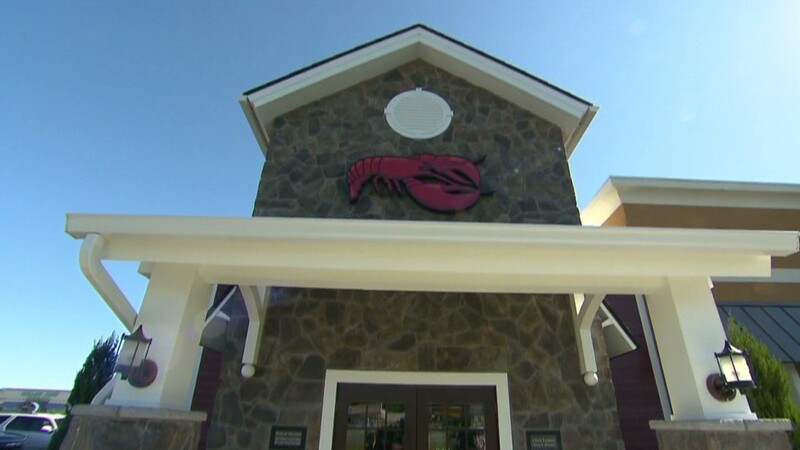 Darden Restaurants (DRI) announced plans to sell its Red Lobster chain to private equity firm Golden Gate Capital $2.1 billion. The company, which also owns Olive Garden, plans to use the proceeds to pay down debt. But the stock fell more than 4% on the news. Shares of WWE (WWE) were body slammed, plunging more than 40% after the company unveiled a new television distribution agreement with Comcast (CMCSA)-owned NBCU late Thursday. WWE expects the deal to result in losses ranging from $35 million to $52 million over the next two years, depending on how many people sign up to watch the Raw and Smackdown broadcasts. The drubbing WWE shareholders took led to an explosion of wrestling references on StockTwits. "$WWE This is where Hogan points a finger at the shorts, shakes his head, & layeth the smackdown :) Shorts won't hold over weekend... I will," said DCGMoo. Some sounded painful. "$WWE They've got us on the turn-buckle!! Might have to put em' in the ol' Steiner Recliner! !," read a post by a user with the unlikely handle of QuietTrades. Dwayne Johnson, a.k.a The Rock, got a shout out. "$WWE So, who got the people elbow today?," said dtman85. One trader seemed to think the wrestling talk was a bit excessive, but still couldn't resist. General Motors (GM) agreed to pay a $35 million to settle a federal probe into the company's decision to delay a recall of vehicles with faulty ignition switches for 10 years. The company has been hit with a string of high-profile recalls lately, and investors seemed to take the news in stride. GM shares were down 1%. J.C. Penney (JCP) shares surged about 15% as the retailer posted quarterly sales that beat expectations and revealed a smaller-than-expected loss. Luxury retailer Nordstrom (JWN) shares also soared on better-than-expected earnings. Verizon (VZ) shares were up about 2% after Warren Buffett's investment firm, Berkshire Hathaway (BRKA), revealed it had purchased a stake worth nearly $530 million in the company. Two companies began trading for the first time Friday. TrueCar (TRUE), a website that offers users guaranteed pricing on cars, priced its initial public offering of stock at $9 a share, well below the expected range. But the stock finished the day up 12%. Scott Painter, the chief executive of TrueCar, acknowledged to CNNMoney that volatile market conditions led the company to lower its offering price. But he said TrueCar is profitable and plans to use the proceeds to boost its profile nationwide. Jumei International Holdings (JMEI), the largest online seller of beauty products in China, rose nearly 10% in its debut. That's after the company boosted the size of its IPO and priced the stock above the range at $22 a share. Strong demand for Jumei could be a sign that investors will have a similarly big appetite for Chinese e-commerce king Alibaba once it begins trading later this year. Indian stocks soared. The nation's benchmark Sensex index surged to a record high as early election results suggested a sweeping victory for Narendra Modi and the pro-business Bharatiya Janata Party. Other Asian markets and European markets both ended the day mixed.